MANILA - Another fast-attack submarine of the United States is on port visit status at Subic Bay in Zambales, as Washington strengthens its show of commitment to allies, specially the Philippines, to continuously conduct "freedom of navigation" sail-bys in international waters near the isles where China has conducted what observers describe as "de facto invasion" in the West Philippine Sea (South China Sea). "The Los Angeles-class fast-attack submarine USS Key West (SSN 722) arrived in Subic Bay for a routine port visit as part of its deployment to the Western Pacific," the US Embassy in Manila said in a statement on Friday, carrying a crew of 150 sailors. Categorized as a second-flight 688 submarine, Key West is designed to carry out a variety of roles, including anti-submarine and anti-surface ship operations, as well as intelligence surveillance and reconnaissance. The 360-foot, 6,900-ton vessel is described as "one of the stealthiest, most formidable submarines in the world." On October 27, Washington had sent its destroyer USS Lassen to cruise within about 10 kilometers off Subi (Zamora) reef, where China has destroyed coral formations and built up an artificial island. The reef is part of the municipality of Kalayaan Island Group (KIG) in Palawan. The US challenge infuriated Beijing, which could not do anything except issue a flurry of hawkish rhetoric. Philippine officials also issued statements supporting the US move in asserting the tenets of freedom of navigation in one of the world's main commerce sea routes that China is wanting to have control though its unilateral "one-dash line". Aside Philippines and China, claimants of the disputed sea include Vietnam, Malaysia, Brunei, and Taiwan. 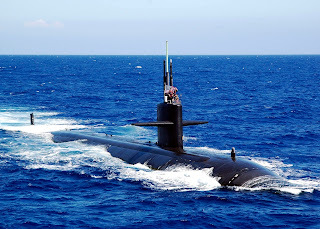 The United States Navy USS Key West (SSN 722) Los Angeles-class nuclear-powered fast attack submarine (SSN).